Hello everyone! We have made it to the fourth edition of Who-What-Wear-Wednesday. Our post today is dedicated to the second wedding anniversary of Brittany C. and the Whittle Master. Let me tell you, these two make for one amazing and inspirational couple. Their strong bond can be credited for the great success of Gem Steady, and they give new meaning to the term, “made with love”. Brittany C. and the Whittle Master are two of the most positive and kind people you will ever meet. They just rock… pun partially intended. The first jewelry creation concocted by this incredible husband and wife duo was Brittany’s wedding band. Gem Steady continues to produce out of this world engagement rings for lucky love birds who are in search of glamorous good vibes that will never go out of style. In honor of the love that Gem Steady has been built upon, we are going to talk about historical and iconic engagement rings today. Sit back, relax, and get ready to read up on some of the most brilliant baubles ever created! Princess Diana: It would be rare to encounter a more glamorous ring than the one given to the late and lovely Princess Diana, by Charles, Prince of Wales in February of 1981. Prince Charles gifted his fiancée a royal ring, consisting of a 12-carat oval-cut blue sapphire surrounded by 14 flawless solitaire diamonds. The precious gems were set in sparkling 18-karat white gold. The ring was selected by Princess Diana herself, and it was not a custom-made piece. It was part of Garrard’s ready-made collection at the time. The unexpected presence of a sapphire on the Princess’ ring mimics the engagement rings of other members of the British Royal Family. The late Princess Margaret’s engagement ring consisted of diamonds and a bright-red ruby that were positioned to look like a rose. Brigitte, Duchess of Gloucester wears an engagement ring made of a large coral stone that is set in sterling silver. After Princess Diana’s passing, Prince William held onto his mother’s precious engagement ring, and gave it to his beautiful wife, Princess Catherine. It was Prince William’s way of ensuring that his mother had a special part of his wedding day. Beyoncé Knowles: This gorgeous musical maven dances her way onto our list of most iconic engagement rings for the rock that Jay-Z presented to Queen Bey in 2008. The hip-hop sensation pulled out all of the stops when he decided to, well, “put a ring on it”. Beyoncé balances a flawless emerald-cut 18-carat diamond on her ring finger that glistens and glows for miles. Without exaggeration, it is quite possible that her ring could be visible from Jupiter. The stunning singer’s elaborate ring was created by famed jeweler, Lorraine Schwartz, and is valued at around $5 million. The enormous diamond is set in precious platinum, and Beyoncé is not shy about flashing her masterpiece to the world when she struts down the red carpet. “It’s my favorite piece of jewelry.” Beyoncé said, in an interview with ABC News. The beauty of Queen Bey’s show stopping engagement ring is definitely one to take inspiration from. Jacqueline Kennedy Onassis: This former first lady was as glamorous as it gets, and she lives on as a timeless fashion icon. She was known for her perfectly tailored suits, which she paired with above-the-elbow gloves, pillbox hats, and a sleek pair of rounded sunglasses. She was also known for the iconic engagement ring that was given to her by the late John F. Kennedy. John F. Kennedy and Jackie O met at a dinner party in 1951, and it was almost love at first sight. The only hiccup in their relationship was Kennedy’s allergy to horses. Jackie O was an avid equestrian. Despite his allergy to Jackie’s furry friends, the two continued to court each other and became engaged in 1953. 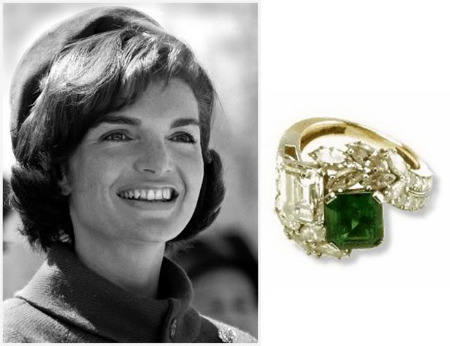 Jackie O was gifted a stunning ring from Van Cleef and Arpels, that gracefully twisted around her finger. The ring featured a 2.84-carat emerald, and a 2.88-carat diamond. Baguette-cut diamonds surround the two large stones, and the shape is very organic. The non-traditional ring evokes a sense of natural beauty. On the day of John F. Kennedy’s assassination, the first lady slipped her precious engagement ring onto her husband’s hand, and stated, “Now I have nothing left.” She reclaimed the ring before his burial, and cherished her beautiful gift for the remainder of her life. Engagement rings are such special tokens of true love. Every woman deserves to have a ring that speaks to her own unique personality. It should intertwine perfectly with her everyday life, and it should be special enough to be handed down through generations, as Princess Diana's ring was. Most importantly, an engagement ring should represent the love and bond between two people. Gem Steady specializes in custom made engagement rings that will become family heirlooms. Each special ring is planned to perfection, chiseled by the Whittle Master, and of course, made with love. This stunning best seller by Gem Steady features a mesmerizing rose amethyst stone, surrounded by sparkling citrine accents. These superb stones are set in 14-karat gold, and are sure to make any woman feel like a princess. Does your man need help picking out the perfect ring? Send him to Gem Steady and we will help him through the entire design process. Now we want to hear from you! What does your dream engagement ring look like? Let us know in the comments below!